AWeber is a service that helps you manage email subscription lists and reach visitors of your site through a rich set of email marketing tools. The Give extension for AWeber helps you connect the service to Give, and allows donors to subscribe to your email lists on AWeber. The first step is always downloading and installing your Add-on and activating your License key. If you need assistance installing and activating Give Add-ons, please read our detailed doc on that here. After your AWeber Add-on is activated, go to “Donations > Settings” and click on the Add-ons tab. There you will see a section called AWeber Settings. Within the settings tab you will see an option called “AWeber Authorization Code“. This code is necessary for Give to integrate with AWeber. 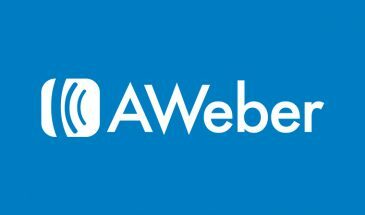 Use your own AWeber credentials to login, and click “Allow Access”. 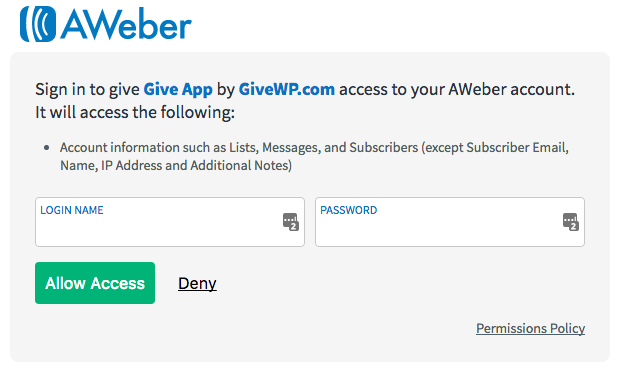 The AWeber authorization code screen for the Give App. Copy the key and paste it in the “AWeber Authorization Code” code input field. NOTE: Give never requests any subscriber data such as emails or communications. 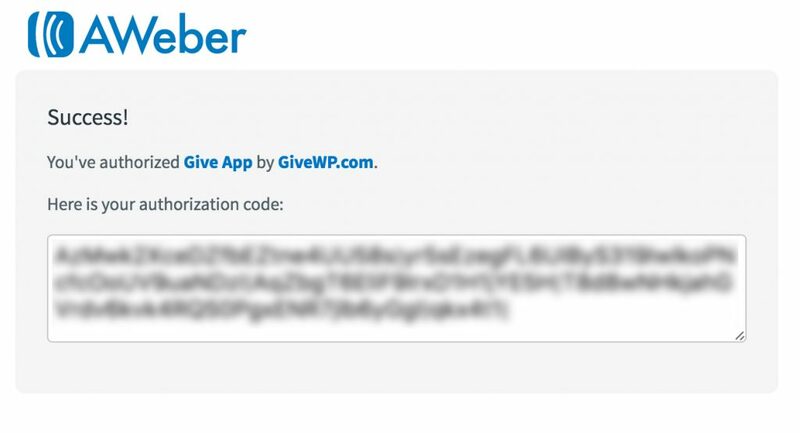 The “Give App” is limited only to populating your AWeber lists in your WordPress Dashboard, and sending your Donor names and emails to your AWeber account. 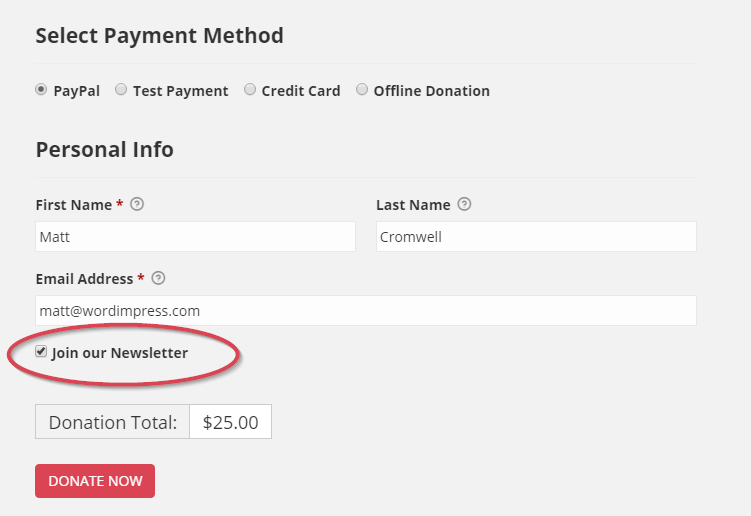 Once configured, you can choose whether all or only select donation forms have an additional subscribe checkbox added to them. 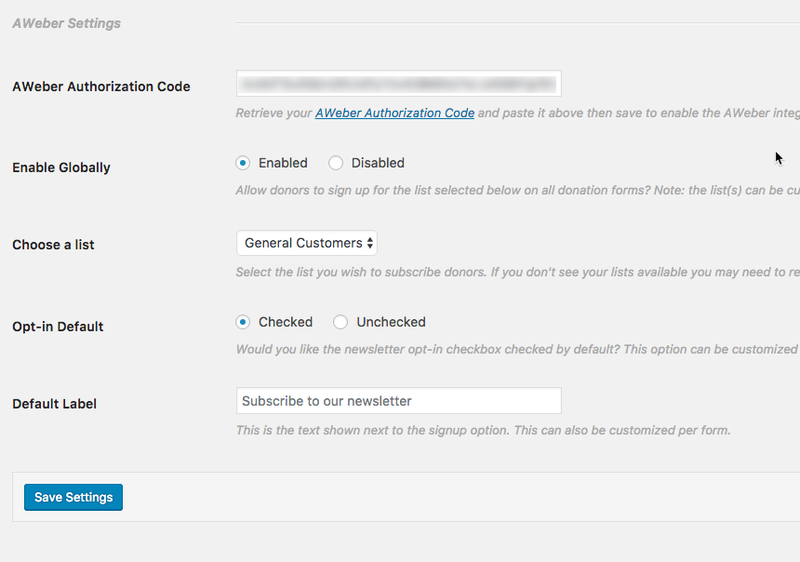 This checkbox informs your donors that they can now opt-into your AWeber email newsletter when the checkbox is checked. In the “Donations > Settings” screen, you previously chose your Global settings. You can override these settings per form as well. For example, you may have multiple AWeber email lists. Generally, you probably will want your donors to go into a list called “Donors”. But maybe you have one donation form that is for a special event called “Annual Gala”. Perhaps for that one form you want those donors to go into the “Annual Gala” AWeber list. Here’s how you do that. Customize — You’ll see options to customize how this one form uses AWeber. Disabled — AWeber will not be used on this form at all. 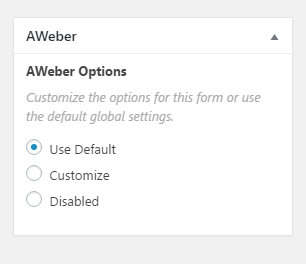 If you choose “Customize”, you’ll see three additional options that allow you to integrate AWeber with this form differently than the Global Default. Custom Label — create a different opt-in label than the Global Default. Opt-in Default — change whether the AWeber checkbox on your form is checked or unchecked by default. AWeber Lists — choose a different email list than the Global Default.